When making the decision to invest in solar systems, not all homeowners can afford to make an out-of-pocket payment of up to $20k or wait almost 10 years to recover their investment. That is why, homeowners use financing on more than 50% of home improvement projects greater than $5,000. 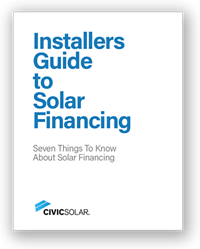 To support you in navigating the world of residential solar financing and find the option that is best for both you and your customers, we have created a comprehensive guide to solar financing and established partnerships with trusted financing providers. The CivicSolar-Greensky program is one of the industry's best unsecured loans.